National Trust classiﬁcation card for Coop’s Shot Tower. Courtesy NTAV. For six decades the National Trust of Australia (Victoria) has played a significant role in shaping how Victorians understand their heritage. The Trust was founded in 1956, during the post-World War II boom—an era of rapid demographic, socio-cultural, economic, technological, and environmental change. 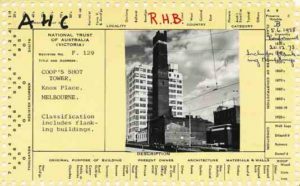 The early members of the Trust were the who’s who of mid-twentieth-century Melbourne, including Robin Boyd, Joseph Burke, Maie Casey, Margaret Kiddle, Brian and Hilary Lewis, Daryl and Joan Lindsay, and many others. The Trust defined its role as “To preserve places and things of natural, historic or aesthetic importance”; an aspirational objective that it pursues to the present day. Yet, the context in which the Trust has operated has continued to shift. The Trust has adapted to these changes, continuously reshaping its relationship to the communities it serves as well as the broader Victorian and Australian heritage landscape. The Victorian National Trust was Australia’s second, following New South Wales, where a Trust was established in 1945. That ﬁrst decade in New South Wales moulded how the various Trusts eventually operated in Australia. It proved that the British National Trust model was not feasible. The Australian Trusts were less exclusive and less resourced than their international counterparts. They were unable to become substantial landholders; for example, to purchase vast swaths of the Australian foreshore. Over the coming decades, the Victorian Trust fought ﬁercely to retain its independence from external interference. It became one of the more adversarial Australian Trusts and was never incorporated by an Act of Parliament. Yet the Trust’s activities have extended well beyond activism. Mark Strizic, Old Melbourne Gaol, 1958. Courtesy of the SLV. Many Victorians ﬁrst learn of the Trust by visiting its historic properties. Como House opened to the public in 1959, and subsequently additional properties came under the Trust’s custodianship; acquired by or bestowed upon the Trust by generous donors or through other kinds of arrangements. 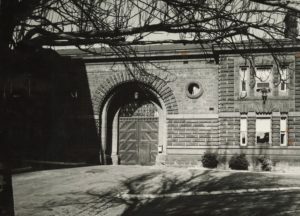 Properties include La Trobe’s Cottage (1964), Illawarra (1966), Polly Woodside (1968), Mt Sugarloaf (1970), the Old Melbourne Gaol (1972), Endeavour Fern Gully (1973), and Rippon Lea (1974). Over the years the displays at these sites, and the ways they are interpreted for visitors, have changed based on emergent modes of museum interpretation. At ﬁrst the Trust sought to present these properties as “authentically” as possible, presenting them as if they had been frozen at a moment in time, various objects displayed alongside detailed panels of text. Yet the problems of that mode of interpretation, rendering the past from a single temporal and social perspective, say that of British colonial elites or of working-class male prisoners, has led the Trust to produce more pluralist and interactive experiences at its historic properties, consistent with contemporary visitors’ sensibilities. National Trust classification card for Coop’s Shot Tower. Courtesy of NTAV. Another way that the community has interacted with the Trust has been by reading its plaques, affixed to classiﬁed places in cities and towns across Victoria. The ﬁrst plaque was placed in 1959 at Como House, and 13 others soon followed, attached to all A-classiﬁed properties, including Parliament House, the Old Treasury Building, the Royal Exhibition Building, St Patrick’s Cathedral, Melbourne Customs House, the Law Courts library, the Royal Mint, St James’ Old Cathedral, Old Melbourne Gaol, Government House, La Trobe’s Cottage, Toorak House, and Tide Gauge House, Williamstown. Architect Robin Boyd wrote much of the original plaque text, and many of these original plaques are still in place. Since the 1950s, the Trust has continued to offer plaques to owners of classiﬁed places, and many can be seen across Victoria, whether lovingly maintained or displaying a patina of age. The classiﬁcation of places has always been the responsibility of independent and expert committees. 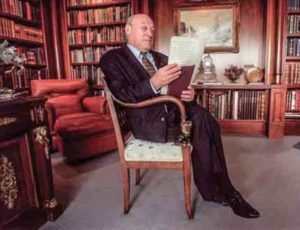 In 1991 historian Graeme Davison described the Trust as “an elaborate hierarchy of patrons, president, vice-presidents, Chairman, and a host of specialised committees and subcommittees, all served by a small professional administration”. The Trust’s expert committees have included luminaries of architecture, history, public art, pipe organs, and natural and cultural landscapes, and have reﬂected the interests of the Trust administrators and members, and their desire to serve the broadening heritage interests of the Victorian community. The activities of these classiﬁcation committees—detailed historic research, sometimes heated debate, preparing engaging written citations—made the classiﬁcation list more robust. The academic rigour provided by committee members such as Professor Miles Lewis also conferred the Trust with added legitimacy for its other activities, particularly its activism. Whilst Trust classiﬁcations largely lack statutory power, the Trust register is nevertheless the oldest and most comprehensive systematic source of information about Victoria’s heritage, and is highly regarded across the heritage sector and wider community. 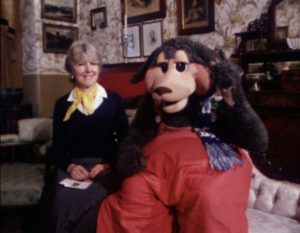 Shirley Hawker and Norm the Kangaroo at Tasma Terrace for Shirl’s Neighbourhood. Courtesy of Channel 7 and the National Film & Sound Archive. The Trust has indeed contributed to the social and cultural life of Victoria by opening its historic properties to visitors, fostering heritage projects, conserving cultural collections, and through its children and school programmes. When Shirl’s Neighbourhood, the Channel 7 children’s television show, came to visit Tasma Terrace in 1980, Trust administrator Shirley Hawker explained the foundation of the Trust: “A [few] people felt that a lot of lovely buildings were being lost, they were being knocked down, and we wouldn’t have them anymore, and that they wouldn’t be here today for boys and girls to enjoy so they got together and formed a sort of club”. Norm the Kangaroo responded, “How sad! That’d be awful! We wouldn’t have had anywhere to go on a Sunday afternoon”, and then asked if he too might be classiﬁed. Norm left for the Rippon Lea Estate as an honorary Trust member. 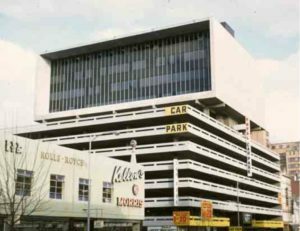 That conversation between Shirley and Norm had come at the end of a tense though vital decade for the Trust and Melbourne’s heritage. Rodney Davidson. Courtesy of NTAV. From the late 1960s, the Trust expanded from a respectable custodian of historic properties to also become a vocal advocacy organisation. For Chairman Rodney Davidson, in a 1974 Trust Newsletter column titled “Our Watchdog Role”, this was no great leap for the Trust from its founding raison d’être. It was merely a product of “the great pressures in the central area of Melbourne”, created by a development boom, placing classiﬁed properties under threat of unsympathetic redevelopment or even worse demolition. He defended his administration: “If you hear anyone saying that the Trust is being over-active, do please explain the tight terms of reference that are always adhered to”. Whilst classifying of those initial 12 properties hardly rattled the community—after all sections of the community had been itching for a Trust for decades—the Trust leadership now had critics from within its membership and also the wider community; particularly now that its classiﬁcation list had expanded to cover lucrative privately owned properties ripe for redevelopment. The issue for the Trust ultimately became how to maintain its respectability and legitimacy, at the same time as being vocal, critical and relevant, at once venerable and dynamic, amidst contemporary heritage and urban debates. 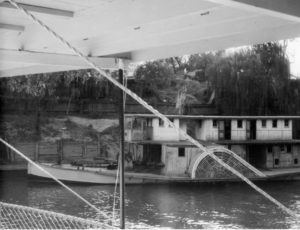 Echuca, 1964. Courtesy of SLV. What places should the Trust attempt to save on behalf of its membership and other communities? How might those decisions be made? Whose interests were the Trust representing? Its membership, its administrators, its committee members, other heritage consultants or activists, architects, planners or historians, politicians, residents, or even developers? Many Victorians and tourists might together enjoy a visit to a historical property or conserved natural landscape, but when it came to places subject to the pressure of public or private development, the Trust had to make compromises about where and how to devote its limited activist energies. Davidson was justiﬁably frustrated by the community’s inability to preserve heritage places without the Trust (or another benefactor) acquiring them as historical properties. He dispatched tense letters to municipal councils demanding historic preservation, even to those such as the City of Brighton that were generally sympathetic to the heritage cause. Planning schemes allowed the designation of historic areas, and the Trust had similarly declared its ﬁrst such area as Echuca (1969). This was followed by a historic area classiﬁcation for South Parkville (1972) on the urging of the local resident action group. However, municipal councils and the state government were effectively unable to refuse a demolition permit on heritage grounds until (Australia’s ﬁrst) state heritage legislation was passed in Victoria in 1974. 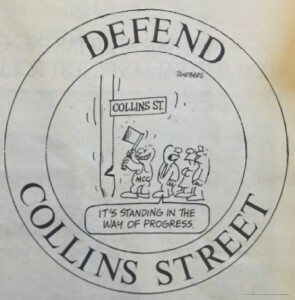 The Collins Street Defence Movement. The area where the Trust has necessarily been most vocal and attracted the most controversy has indeed been in its activism. The major battleground for heritage in the 1970s became Collins Street, and the National Trust campaigned vigorously to preserve the street’s nineteenth-century places. Although the Trust remained the most venerable heritage activist organisation, it was no longer the only heritage player, with the founding of new activist organisations, regulatory agencies, consulting groups, and auxiliary academic research clusters, even if most maintained connections to the Trust. The Trust nevertheless retained various community, professional and statutory roles, and its classiﬁcation register—which inﬂuenced government heritage registers—allowed to Trust to continue to exert pressure for historic preservation at places that were, in its view, not adequately recognised by the emergent heritage system. A particular hotspot was the recognition of twentieth-century places as worthy of historic preservation, which no doubt will extend to twenty-ﬁrst century places in the coming decades. Total Car Park, c1960s. Photograph by Peter Wille. Courtesy of SLV. The Trust has indeed expanded what it considers its remit. More recently, it has been embroiled in battles at everyday heritage places like pubs and clubs and urban renewal and regeneration precincts, often taking positions contrary to heritage consultants, whose industry the Trust originally helped establish. Recent examples range from the Palace Theatre and the Windsor Hotel, Total Carpark and ICI House, to Fishermans Bend and Pentridge Prison. A less visible yet still productive activity has been its eff orts to inﬂuence heritage policy and management practices. Overall, the Trust has been a signiﬁcant organisation in the institutionalisation, professionalisation, regulation and recognition of heritage in Victoria. The Trust continues to operate in a now substantial heritage landscape. Across its various activities, the Trust has worked to expand the boundaries and shift the contours of Victoria’s heritage protection. In other words, through vigorous debate and tireless on-the-ground eff orts, the Trust has broadened what Victorians might understand as and so seek to keep as heritage, and also the ways it might do so. Many of these eff orts have been predicated on the administrators, leadership and membership of the day. As a consequence of its extended and sometimes controversial 60-year legacy and its attempts to continuously reinvent itself to reﬂect contemporary sensibilities, the Trust has always remained a target for both justiﬁed and inﬂated criticism. Over the last few years, the Trust has participated in a large number of Victorian community events: from the Heritage Festival to Melbourne Open House, and most recently the Melbourne Romp, White Night and other immersive, place-making exercises. Such programs are fundamental to raising a heritage consciousness amongst new generations of Victorians. On the occasion of its 60th anniversary, the challenge for the Trust is to not only reﬂect on its proud past and present activities, but to also continue to innovate and challenge the status quo in creative ways, whilst remaining attentive to the broader contexts in which it operates. The National Trust has published two indispensable institutional histories: Mary Ryllis Clark’s In Trust: the ﬁrst forty years of the National Trust in Victoria, 1956-1996 (1996), and Clark and Victoria Hammond’s From Brunswick St. to Bells Beach: the ﬁfth decade of the National Trust in Victoria 1997-2006 (2006). For a broader history of the Australian heritage movement see the classic text Graeme Davidson and Chris McConville (eds), A heritage handbook (1991). The most comprehensive overview of Victoria’s local heritage studies is found in Robyn Clinch, The places we keep: the heritage studies of Victoria and outcomes for urban planners (PhD Thesis, Faculty of Architecture, Building & Planning, University of Melbourne, 2012). Records of the National Trust are found at the National Library of Australia (Australian Council of National Trusts collection), the National Film and Sound Archive (eg, Shirl’s Neighbourhood and various ﬁlms produced by the National Trust), the State Library of Victoria (especially publications and ephemera), Public Record Office of Victoria (some early Trust records and correspondence between government agencies and the Trust), the University of Melbourne Archives (ie, the Miles Lewis and David Yencken collections) and the Trust’s institutional archive. Valuable websites related to the National Trust and Victoria’s heritage include the National Trust (www.nationaltrust.org.au/vic/, www.trustadvocate.org.au), Victorian Heritage Database (vhd.heritagecouncil.vic.gov.au), eMelbourne (www.emelbourne.net.au), Melbourne Heritage Action (melbourneheritage.org.au) and Miles Lewis’s homepage (www.mileslewis.net). I honestly think we would have lost so much more if it wasn’t for Rodney Davidson, he must’ve had so much energy and confidence doing what he did in his spare time (!). I worked at the Trust on and off for 20 years from 1990 and never met him, but his name is in every file in every newspaper article for every battle from the early 70s to the mid 80s at least. 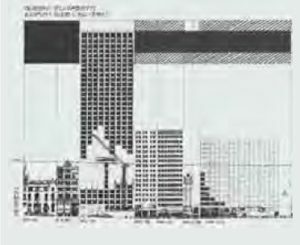 The Regent and the Domed Banking Chamber (333 collins) files are fascinating (and large!) and of particular interest because the State Government held special inquiries in I think 1973 that produced bound reports, both recommending retention – those inquiries wouldn’t have happened without him, though they were also both well loved places.